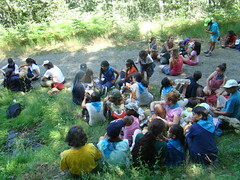 Last weekend, for the first time this year, we had a day encounter for girls in Zurita, Cantabria (Spain). 11 girls came from Santander and Torrelavega. 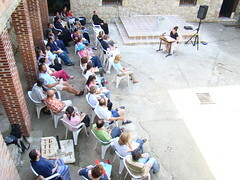 This year, the Summer Family Encounter in Spain took place in Barcenilla (Cantabria), from August 15-19. 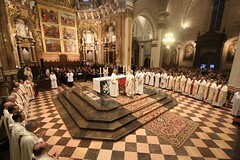 There were members of the Home participating from Spain, Italy, and the United States. 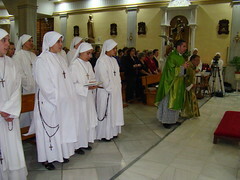 In August 2012, the Servant Sisters of the Home of the Mother organized a pilgrimage for girls to visit Italy, Germany, Austria, the Czech Republic and Poland. It was a challenge! 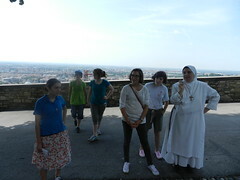 Following the pilgrimage´s motto: ¨May God guide us, we are in his hands. 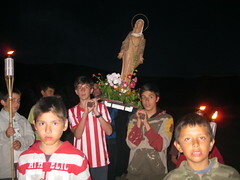 Trust and hope,¨ we flung ourselves into the hands of God and of Our Mother and began the pilgrimage. 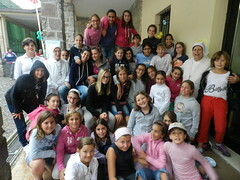 The Home of the Mother also held a summer camp in Italy this year! 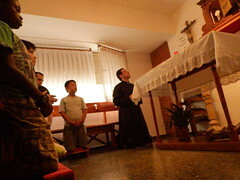 Since there are two communities of Servant Sisters very close together, Lumezzane in the province of Brescia and Brignano Gera D´Adda in the province of Bérgamo, we were able to come together for the occasion. 58 girls, 36 from Brignano and 22 from Lumezzane participated this year in the summer camp in Vilminore di Scalve, a wonderful place in the mountains of Bérgamo. 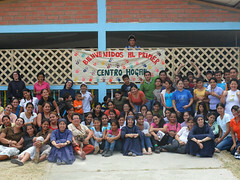 The first ¨Centro Hogar¨encounter was organized in Ecuador. More than 100 people, members of the Home of the Mother from Guayaquil, Chone and Playa Prieta, came together from the 10th to the 12th of August in the school which the sisters run in Playa Prieta: the Sacred Family Academy. 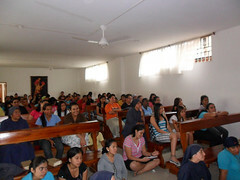 Spiritual exercises, for girls and women of the Home of the Mother from Playa Prieta and Chone, were held from the 3rdto the 7th of August. This summer, as usual, we had a girls´ summer encounter in Spain, in a little town called Peranzanes in the province of Leon. 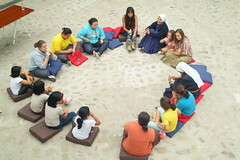 Over 45 girls, ages 7-18, from all over Spain took part in the summer encounter from July 18th-28th. But it wasn´t just your typical summer camp. Oh, no. It was truly survival of the fittest. We´re back from the Home of the Mother Boys´ Summer Encounter in Leon, Spain! For all of us who are able to participate, the Home of the Mother Summer Encounters are, each year, a great event in our lives. It´s an unforgettable experience which has a big impact, on both a human and spiritual level, on all those who take part. 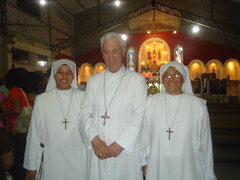 Sisters Merly and Martha renewed their temporal vows for one more year at Our Lady of Loretto Parish in Guayaquil, Ecuador this past July 2nd. After much preparation, we were really excited to get the Home of the Mother English Immersion Camp underway in Gavilanes (Avila, Spain), from June 29th-July 14th. 90 girls took part, aged 8-18, from all over Spain and the USA. For a lot of them, it was their first time participating in a Home of the Mother activity. 13 Servant Sisters and 2 Servant Brothers consecrated themselves to God, entering the novitiate on July 16th, the Feast of Our Lady of Mount Carmel. The Home of the Mother had a celebration on July 2nd: 10 Servant Brothers and 23 Servant Sisters consecrated themselves to God. Last Wednesday, June 27th, the Servant Brothers of the Home of the Mother in Valencia, along with a friend, Juan Herrera, went on a trip with the altar servers of St. Dionysius and St. Pancratius Parish in order to celebrate the end of the school year. Br. Greggy Espejon, Br. Andrew Krische, and Fr. Félix López were en route from Barcelona Airport to Croatia this past May 29th, with a group organized by Alberto, a seminarian from Madrid. 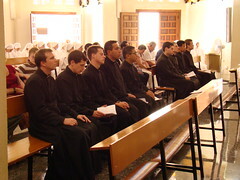 We traveled with four deacons and two priests from the Bidasoa Seminary in Pamplona (Spain). Our group was a living image of the Catholicism of the Church, with representatives from various countries: Indonesia, Mexico, Peru, Ecuador, El Salvador, Philippines, USA, and Spain. Eight different countries were represented within a group of 10 people.